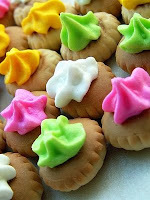 Early in the morning I had my quick fix of Iced Gems. It will be remembered when were were in our yester years that we see this in stores. An oblong shape piece of bread with a dried icing on top that comes in different colors. It's not visible in stores now but I was able to have a colleague here in the office to buy not one but 12 pcs of Iced Gems in one pack which cost Php 50! Yummy! After finishing off one pack after 2 hours, my friend Oieyds and I took our usual brunch. Around 2pm I got hungry and decided to buy a dessert which is "pastillas de leche" a pastry that does not require baking. 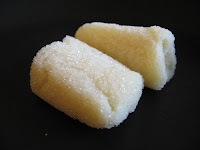 All you have to do is mix all the ingredients which are milk, sugar and butter then rolled them into your desired shape. And now, I'm done eating another pack of Iced Gems! I think this is the only day where I ate a lot of sweets. I just hope that this will last for this day only.